Nutrition is important to make informed decisions about your family's dietary preferences. Less than 20% of recipes include this information. This is why we've worked with ESHA Research to develop an easy to use nutrition calculator for any recipe. A World Leader in Nutrition for 30 Years. Trusted by Hospitals, Dieticians, Nutritionists, and Top Food Manufacturers. After free trial only $7.95/mo. Unlimited Recipes. Save 30% on yearly plan! Simply copy and paste ingredients into the online form. Then submit! 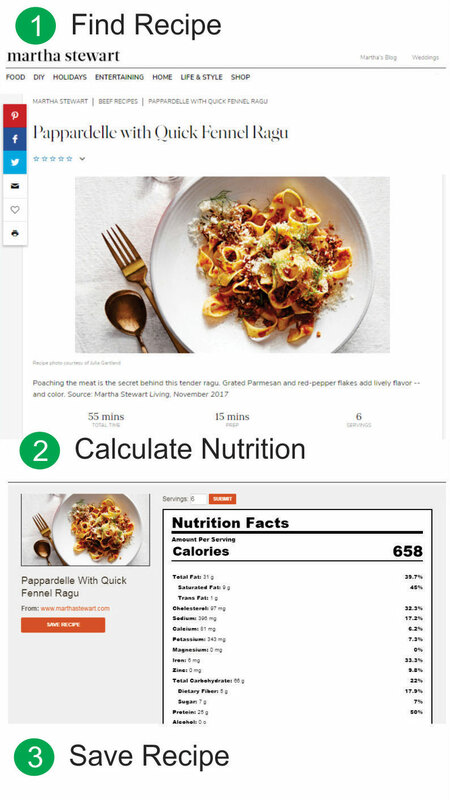 Easily install the nutrition button to calculate nutrition for recipes while surfing the web. Then save to Meal Planner Pro.